Five and one with the picks for week five puts the season tally at 38-8. UCLA and Arizona State take the week off but the rest of the conference squares off against each other on Saturday. But first our quick review of last week’s results. Luke Falk completed 34 of 51 for 340 yards and a pair of TD’s but it was place kicker Erik Powell’s 32-yard FG with 1:40 left that lifted the Cougs to their first win over a top-5 team since 1992. USC quarterback Sam Darnold was harassed from start to finish by an aggressive WSU front seven and never got untracked, finishing the night with 15 completions in 29 attempts with a score and a pick. Now the question is can the Cougs do it on the road. Second half meltdowns have been the modus operandi for the Bennys this season and it was no different against the Huskies. Within a stones’ throw at 7-0 when they came out of the break, Oregon State coughed up 35 second half points to the Huskies and didn’t reach the end zone until the last minutes of play – a Thomas Tyner touchdown from 12 yards out. Bryce Love ran for 301 yards, scoring three touchdowns from 61, 43 and 59 yards to rewrite the rushing records on the Farm. The junior running back leads the nation in rushing has already eclipsed the 1000-yard mark in only five games. Josh Rosen threw for 372 yards, completing 28 of his 45 attempts to hold off the Colorado Buffaloes in Pasadena. A fourth down Hail Mary by Colorado quarterback Steven Montez was incomplete, sending the Buffs to a second straight defeat. Montez completed 17 of 36 for 243 yards and a score and was Colorado’s leading rusher with 108 yards on 15 carries. UCLA was held to 95 yards rushing. Not to be overlooked is the fact the Ducks have equaled last year’s win total in just five games. Not to be ignored is the schedule is a minefield, one Oregon must navigate with a depleted roster. 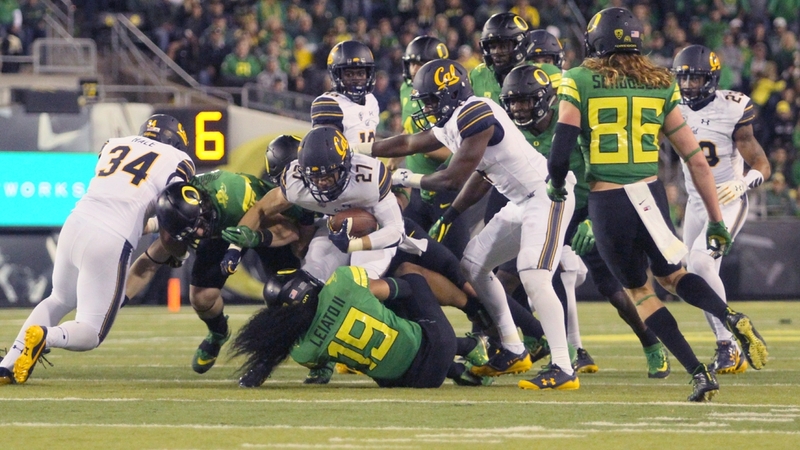 All that noted it must be said the Oregon defense appears to be coming together into an aggressive, cohesive unit and that alone can keep a team in most ballgames in the Pac-12. If the offense can maintain possessions and score 27 to 30 points a night, the Ducks may yet have some sway in the northern division race. And the penalties will have to stop. After a poor outing in Pullman, Trojan quarterback Sam Darnold and the USC offense have to be licking their chops to get things back on track against the Beavers. OSU hasn’t won in the Coliseum since 1960. USC 45-3. The Huskies remain the most consistently impressive team week to week in the conference. California is improved under head coach Justin Wilcox but not enough to make a ruckus in his return to Montlake. Washington 52-17.
Who can stop Cardinal running back Bryce Love? The Utes’ defense has the chops but Love is on a tear this season and Stanford head coach David Shaw no signs of changing the game plan anytime soon. Rice-Eccles Stadium is a tough road date so a Utah win wouldn’t surprise, but the thought is Love – and Stanford – has the firepower to come away with a 33-24 win. A disappointing loss by Colorado in Pasadena last week should provide sufficient motivation for the Buffs to wallop the Wildcats in Boulder, 38-28. To be clear… if hard earned cash was on the line, this pick would be reversed. All applicable logic points to Washington State earning a third straight win in the series. But assuming the Oregon defense can continue to improve and that in their first road game the Cougars and quarterback Luke Falk aren’t able to get Mike Leach’s Air-Raid offense running on all cylinders right from the jump, maybe Oregon can hang close and find a way in the end. Ducks 32-30.